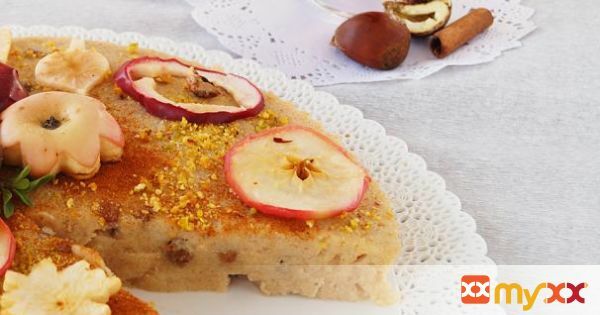 The following recipe is to prepare the autumn Halva from semolina flavoured with apple, cinnamon, raisins, and nuts. 1. Mix sugar with water and cook a few minutes until the sugar dissolves. 2. Chop apples, mix with raisins and cloves, add ¼ l of water, boil on low heat for about 8 min. 3. Melt the ghee (a healthier form of clarified butter without milk proteins) and gradually add semolina stirring over medium heat, sauté until golden brown. 4. Add the syrup and stir gently over low heat until the mixture starts thickening. 5. Add apples with cinnamon (take cloves out), stir and when the mixture begins to separate from the pot, transfer to a greased form (27 cm / 10.5 inches in diameter). 6. Allow to cool and solidify. 7. Meanwhile, cut apple slices, then carve apple flowers and leaves, place on the rack and leave in the oven at 150-170 ° C (302-338 ° F) for about 10 min. 8. Then take Halva out onto the tray and garnish with roasted apples and other ornaments mentioned in the Ingredients section.